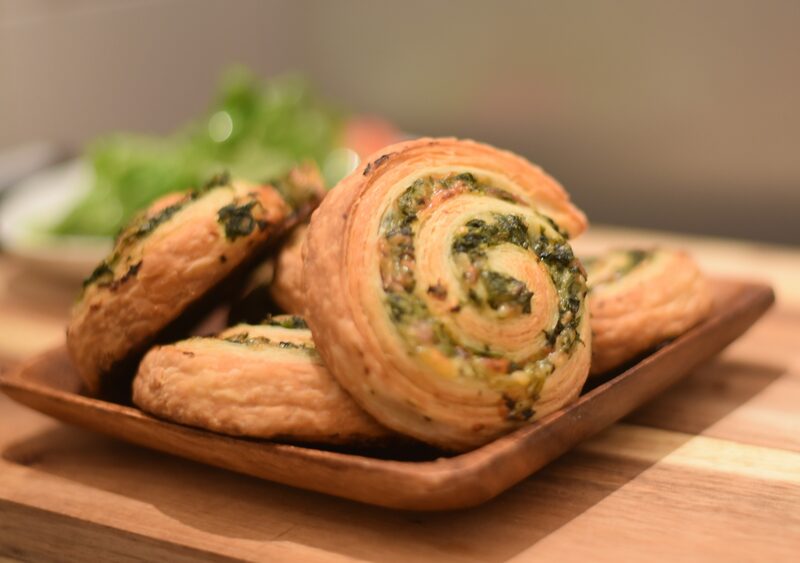 Why spinach and cheese rolls? good question because my plan was to go for sweet pastry. I was about to make a great chocolate swirl with my Danish pastry dough which I made in advance when I had an unexplained craving for a savory pastry. Digging thru my fridge I came across a great spinach popping out, Kashkaval and Gouda cheese, there it is, here’s my pastry. 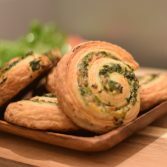 When you think of savory rolls, you usually come up with the store-bought puff pastry which in most cases is not so bad, I actually use it quite a bit when I need a spontaneous pastry for entertaining or for dinner, but let me tell you this, the Danish pastry dough really takes these spinach and cheese rolls to the next level. 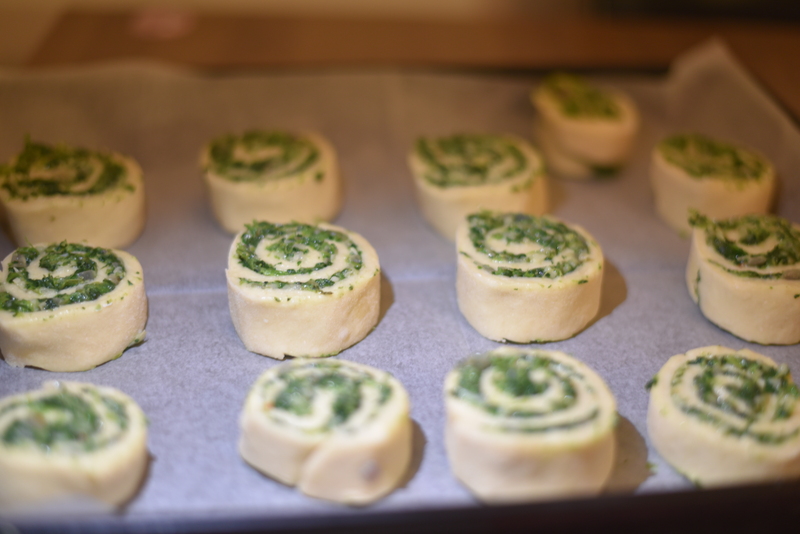 It’s easy to say that this pastry is fast and effortless, I mean this might be correct once you got the dough ready, forgetting we slaved over the dough for a few hours. Well, truth is, lately I’ve been making a big batch of Danish pastry dough and freeze it in a 1 pound/ ½ kilo batches, so indeed, it took time but making 3 kilos of dough and making 1 kilo takes about the same time, not much difference, so I encourage you to make a big batch, this is the most efficient time use regarding this dough. 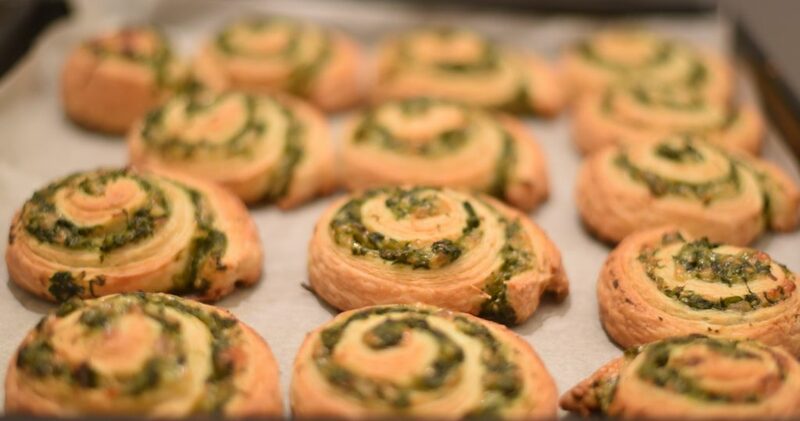 Of course, store bought puff pastry will be good as well, but wait until you try these great savory rolls with Danish pastry dough, so flaky and tender you will need to bake a few rounds of it. Making the spinach filling is fast and easy, it’s important to blanch the spinach before adding it to the olive oil and onion, it will help keeping texture and color of the spinach as well as making sure all sand is cleaned. 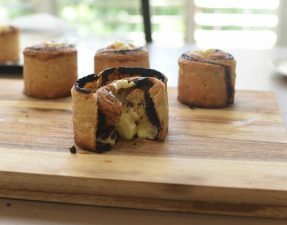 The cheese type is really up to you, I used kashkaval and Gouda, I wanted a deep rich flavor but other cheese kinds are great as well, emmental, cheddar or any goat cheese will do just fine. I didn’t use any egg wash because the Danish pastry dough does not need it, however if you’re using puff pastry or any other yeasted dough, use some egg wash but note that when using egg wash the pastry appears in a perfect golden color before the pastry is actually ready so don’t be fooled by the color. 4 cloves of garlic diced finely. 1 batch of spinach, about 1 kilo/ 2 lb. 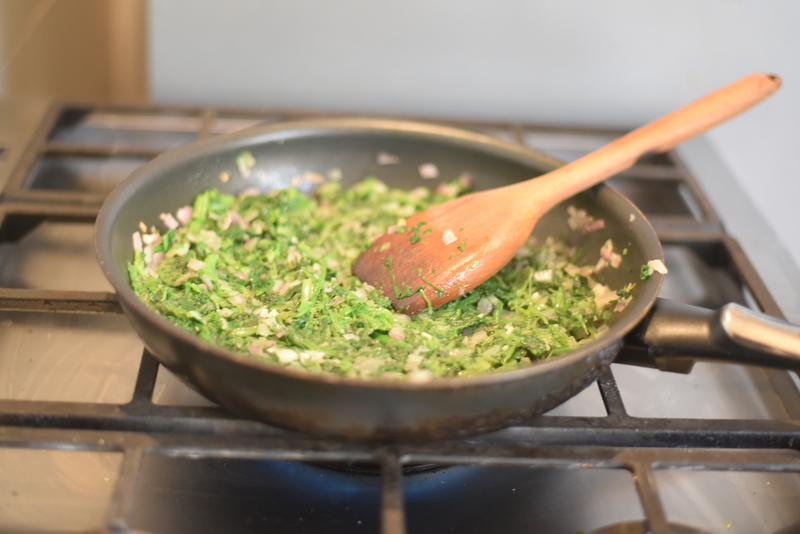 blanch the spinach , Set a large pot over high heat, when the water boil add the spinach, if necessary in 2 batches. Keep the spinach in the water for about 4 minutes. take out to an ice bath, squeeze out of excess water and cut finely. Set a large sauce pan over medium-high heat. Add the olive oil and the onion and cook for about 5 minutes until transparent, Add the garlic and cook for 1 more minute. 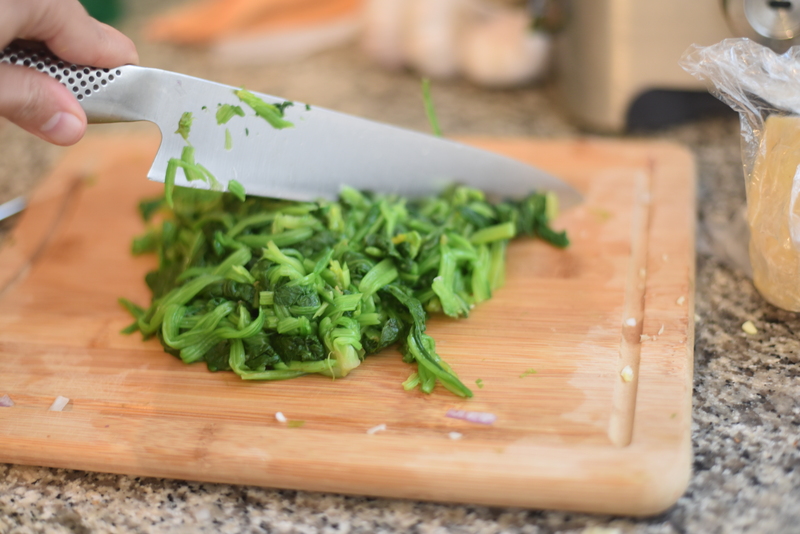 Reduce heat to low, toss in the spinach, season with salt and pepper and cook for 3 more minutes. Cool the spinach mix for 10 minutes, add the cheese and mix well. Flatten the Danish dough into a 30x50cm/ 10X17-inch rectangle shape. 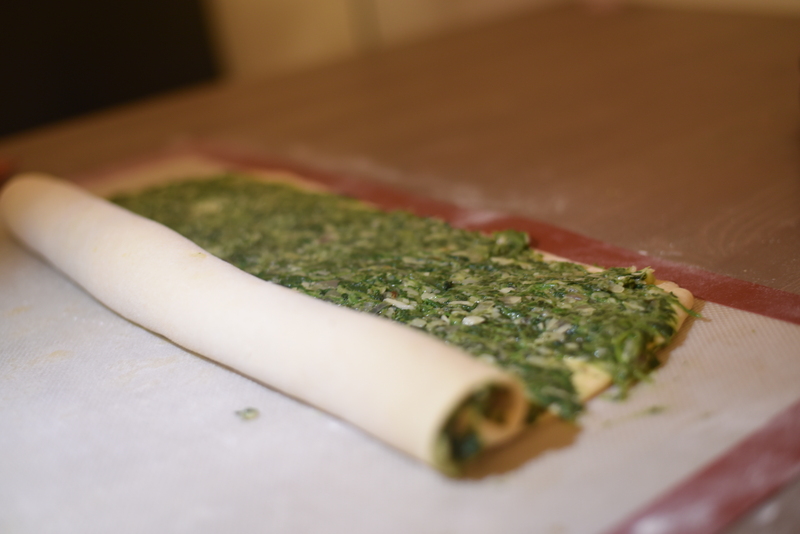 Wipe the spinach mixture over the dough and roll the dough tightly. 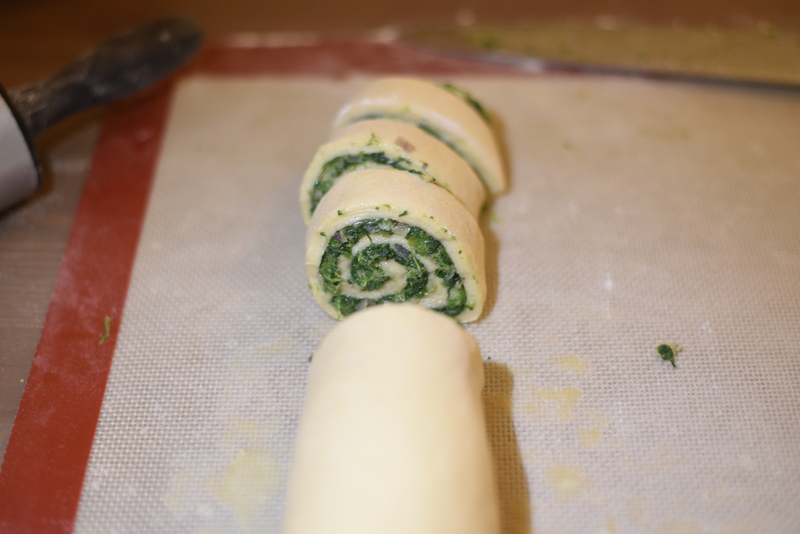 Cut the spinach roll into 4cm/ 2-inch pieces. 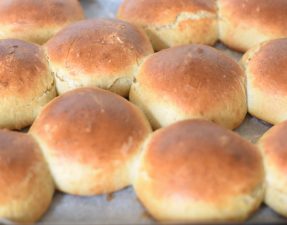 Place the rolls on a baking pan and proof for 45 minutes. Preheat the oven to 180°c/350°F. 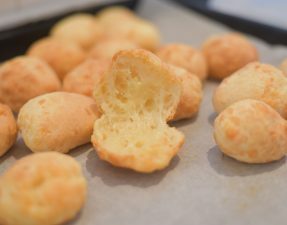 Bake for 30 minutes until reaches golden color. Take out of the oven, let cool for 10 minutes (if you can...) and serve.